At Fruit Logistica Berlin: interest from international companies in new varieties and selections from CIV. Success in the meeting with international Modì® apple License holders. From Fruit Logistica in Berlin to the 2019 Global Berry Congress (www.berrycongress.com), to be held in Rotterdam 25 – 27 March. 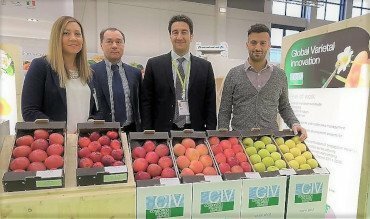 CIV [Consorzio Italiano Vivaisti di San Giuseppe di Comacchio (Ferrara)] takes stock of its participation in the Berlin trade fair and looks forward to the next event in the Netherlands. During an evening event at the Steigenberger Hotel in Berlin, the first CIV & Friends Meeting included the presentation the CIV Product Portfolio, featuring new apple varieties and selections for the numerous sector-operators in attendance. Then, during the usual Modi® Apple International Meeting organized by CIV, owner of the patent for the Civg198pvr apple variety and the Modì® brand under which it’s sold around the globe, our international License holders (Europe, Turkey, Serbia, United States of America, Australia, Uruguay, Chile and New Zealand) met to further develop the Modì® brand and share marketing and production best practices that fully respect environmental sustainability. During the trade fair in Berlin, in the large, updated CIV exhibition area, President Pier Filippo Tagliani, with Variety Manager Marco Bertolazzi, Modì® Project Manager Dario Lezziero, and IP Manager Elena Piccoli met with numerous international operators interested in the latest from CIV in terms of apple, pear and strawberry varieties, which stand out largely for their ease of cultivation, high yields, longer storage and shelf life, elevated organoleptic properties, an appealing appearance, adaptability to different pedoclimates, and disease resistance (a central element in CIV’s genetic improvement programme). “With regard to the meetings in Berlin”, stated Variety Manager Marco Bertolazzi and CIV President Pier Filippo Tagliani, “we registered a concrete interest, from some important international groups, in our selections and varieties of apples, strawberries and pears, the latter developed by the University of Bologna thanks to private investment by CIV. For the upcoming weeks and trade exhibitions, we’re committed to defining the most suitable ways to develop varieties in the markets of the interested companies in order to quickly finalize the relative strategic and operational partnership/collaboration agreements”. As for the 2019 Global Berries Congress in Rotterdam, organised by Eurofruit in collaboration with Fruit Logistica, the conference will be entirely dedicated to berries – one of the fastest growing categories in the fruit and vegetable sector worldwide. During the three-day event, key players in the sector from all over the world will display their latest innovations in terms of product/service, with exhibits/shows, and will tackle the most important challenges of the next five years. The global production-distribution supply chain will be fine-tuned, from research to production to sales and the end consumer. CIV and its Northern Europe Partner (Idris Consulting Ltd – www.strawberries.eu.com) Dr. Johan Aelterman will be present at the event with their own stand to illustrate CIV’s increasing dedication to the research and development of new strawberry varieties designed to better meet the needs of a constantly-evolving market. From Northern Europe to the Mediterranean Area, CIV will enlarge its presence thanks to its well-known and widely commercially developed strawberry varieties (i.e. : Flaviapbr, Flaminiapbr, Muranopbr, Capripbr, Clerypbr, Jolypbr, Nabilapbr, etc.). Other interesting advances will also be highlighted: everbearers suitable for cold weather areas (CIVRH612pbr ANIA®, CIVRH621pbr CANTUS®) as well as more moderate to warm climates (CIVRL333pbr XANTE®), and for June-bearing varieties from north (CIVNB557pbr LYCIA®) to south (CIVS906pbr ELIDE®), which have piqued the interest of sector operators. “In general”, concluded CIV Variety Manager Marco Bertolazzi, “we can talk of seamless success for the CIV strawberry breeding programme, which has been active since 1984, and developed along four research lines: strawberries for temperate Mediterranean climate, continental climates, everbearers, and varieties suitable for industrial processing. The use of classic techniques and the development of new varieties that can guarantee high production of top quality fruits, along with the natural hardiness and vigour of the plants, are the CIV’s primary goals to offer the national and international markets not just quality but the best in environmental sustainability”.